New nail polish and 60 degree weather. I couldn’t resist. It’s hard to see from the picture but these shoes are about 4-inch high wooden wedges similar to geta. I’m your classic overly cautious first born, but there’s a time of year when I’m even more of a safety freak. It’s fall and winter. That is, it’s the period where an injury could sideline me for ski season. I love to downhill ski. So during this time of year, I carefully climb up and down ladders, step stools, etc. Extra crucial since this is also when Christmas decorations go up and down. My biggest fear is breaking-tearing-spraining something and putting an end to my season. Skiing is my favorite sport and something we did as a family. I was fortunate to have a youth pastor who liked to ski. He made sure we had at least annual trips to various Indiana, Michigan, and Wisconsin ski hills. Some of my best youth group memories revolve around skiing. When my husband and I were dating, one of my criteria was that he learn to ski. Fortunately, his first job was in the mountains, and he spent several weekends on the slopes. Now that we live near a small ski resort, it’s one of our favorite date nights. In fact, that’s where we were on Saturday. I prefer day skiing but night skiing is cheaper. We’re teaching the kids too. Our nine-year-old can tackle most green runs and our five-year-old will have her second season this year. Last year we taught her using a hula hoop. I admit to throwing a little caution to the wind recently. I love shoes, especially boots. So when temperatures hit 60F here in the mountains, I couldn’t resist showing off my new nail polish in my favorite dressy sandals. 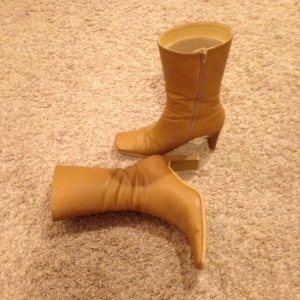 And I snagged a cute pair of hand-me-down boots that I have been dying to wear. Fortunately, no GEKEs were harmed while wearing the footwear. Now I’m praying for snow and waiting for the next time I can hit the slopes. What sport did your family do when you were growing up? Now that you’re an adult, do you still participate? Have you passed on the love to your spouse and/or children?